Kate Bush, Hammersmith Apollo 26/8/14: "There's someone who's loved you forever"
I was barely one week old when Kate Bush quit touring. Thirty-five years, three months and thirteen days later, tonight’s return to the live stage was literally the event of a lifetime. Arms pinched red, not quite able to believe that something this good was really going to happen, I was one step away from a cardiac arrest… Kate freaking Bush! In real, actual life! Suffice to say, this is not an objective ‘review’. Eighteen months in the making, and with a running time of nearly 3 hours plus interval, it was clear from the outset that we were here to see a piece of theatre rather than a concert. That said, the first of the three acts is surprisingly spare as Kate gives herself not much more to do than a lot of gesturing, pointing and small, slightly awkward twirls around the stage. The focus is entirely on her voice and the flawless musicianship of her seven-strong band, though lighting designer Mark Henderson deserves every ounce of praise for his outstanding contributions. There are no dancers, no props, no distractions, just humble, happy Kate and a five-piece chorus starring her 16 year old son and Before The Dawn ‘creative advisor’ Bertie, who claps his hand over his heart when mum reveals the extent of his involvement in bringing her back to live performance. Move aside Beyoncé and Blue Ivy, parental moment of the year belongs to tonight. It’s tempting to speculate on how Kate chose the six songs that make up this first act, drawn as they are from just three album eras: ‘Hounds Of Love’ and ‘Running Up That Hill (A Deal With God)’ from 1985, ‘Lily’ and ‘Top Of The City’ from 1993, ‘Joanni’ and ‘King Of The Mountain’ from 2005. ‘Lily’, a song based on an occultist protection spell, opens the show with references to the Golden Dawn and a circle of fire, providing a thematic link for what is to come in act three. Lights flash red and orange as the song passes by in a blur of mental processing… Kate freaking Bush! In real, actual life! Then, almost without pause for breath, everything is jolted into focus – “It’s in the trees, it’s coming!” – and we’re racing through one of the greatest pop songs ever written. Kate slightly over-sings it, caught up in the glorious moment, but it still feels like a fresh and staggering milestone in passion. All this on only the second song of the night. Before The Dawn is not for the fainthearted. From there, Kate’s vocals never stray far from perfection. ‘Joanni’ and ‘Top Of The City’ confirm that the brittle purr and fierce-fragile sensuality of her youth are still very much within her reach, making the most of the bespoke surround sound system newly installed at Kate’s behest, while ‘Running Up That Hill’ loses not a fragment of its power. But perhaps the biggest highlight is ‘King Of The Mountain’, her mid-tempo comeback single from 2005, transformed brilliantly into something altogether more urgent and vital than the studio version. Wide-eyed and energised, we arrived abruptly at what could be described as the staging’s clickbait moment: “This woman sang in public for the first time in 35 years, and you’ll never guess what happened next…” To be honest, it was at this point that I stopped taking notes. I could labour over the details of how The Ninth Wave is staged, but to do so from my crow’s nest view at the back of the Apollo would be a terrible disservice to the incredible amount of work that has gone into this production. Readers, I was rapt. What I can say for certain is that I have never seen anything like it before. Kate’s commitment to the project extended to floating in a tank at Pinewood Studios for several hours to create the astonishingly effective video backdrops that underpin the twisted tale of a woman lost at sea. The agitation in her face may have been aided by the cold that, according to her own essay in the programme, left her effing and blinding by the end of the shoot, but the acting was as note-perfect as the voice. For some of these segments, the vocals had been recorded in the tank itself – a logistical nightmare that ended the life of more than one mike – and it’s to Kate’s immense credit that she took this extra step to ensure we really believed in the story. ‘And Dream Of Sheep’ brings a lump to the throat, as Kate’s character comes to terms with her predicament and hopes for an early demise. The deliberate tremble in her voice cuts like an axe, both pathos and payoff, and resurfaces again in the chilling ‘Hello Earth’ – the story of a rescue… or is it? Between those two songs comes a melee of action, where dark, twisted drama is leavened with a few endearing nods to Kate’s enduring love of British comedy. ‘Under Ice’ and ‘Waking The Witch’ are fearless evocations of Kate’s visual imagination, loaded with creative innovations that bring the storytelling into vivid, 21st century realness. Lasers and projections are used to extreme effect, creating all manner of light trails across the stage. Images flood into the brain; in one gorgeous moment, wild white horses can be seen running through sheets of rippling fabric, returning into waves as dramatically as they had changed. As ‘Jig Of Life’ plays out beneath her, the stranded woman on the screen starts to draw strength from her surroundings, wiggling her fingers in time to the music. She wants to live, to be saved. She has to, doesn’t she? With her little light still shining. Act three is all about light, a chronicle of day as it turns into night. This act belongs to A Sky Of Honey, the nine-song suite that fills the entire second disc of Aerial with chirrups of birdsong and abstractions of domestic bliss that give way to some of Kate’s more out-there leanings. It’s true that nothing much happens in these songs, with a couple of notable exceptions (the flamenco breakdown in ‘Sunset’, the crescendo of ‘Nocturn’ that leads into the wheeling, madcap finale of ‘Aerial’), but, as with everything we’ve seen so far, it’s marvellously and inventively staged. As the light transforms, so does Kate herself as a wicked spell abounds. Perhaps the most moving element of A Sky Of Honey lies in the skilful puppetry that brings to life what may or may not represent Kate Bush’s son at the age he was when Aerial was born. It would certainly explain why Kate hugs his short wooden frame several times throughout the set, and why Bertie himself, while playing the character of The Painter, gets to tell him(self) to “Piss off!”. Keep an eye on that puppet, if you go. He’s not as hapless as he seems. The first song of the encore visits Kate’s most recent body of work, 50 Words For Snow, in the shimmering form of ‘Among Angels’. For this, Kate sits alone at her piano, exposed and, I suspect, feeling rather triumphant. “There's someone who's loved you forever but you don't know it, you might feel it and just not show it…” – a perfect summation of what has been exchanged between this most singular of artists and her singularly patient admirers. Both sides are showing it now, as the full band returns for the thundering consummation of ‘Cloudbusting’. 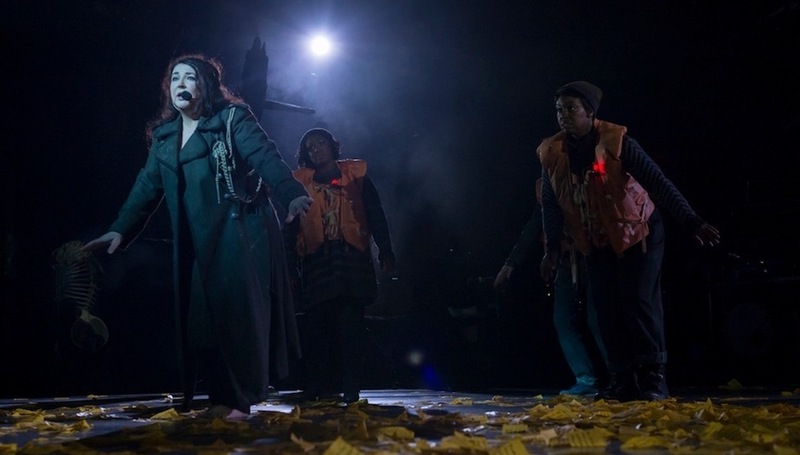 “On top of the world, looking over the edge…” Kate Bush has finally seen her people looking right back up at her. With 21 more shows to go, will she then retreat once more? Her face as she leaves is framed by an expression of deep gratitude, suggesting perhaps she will not. Before the Dawn is at Hammersmith Apollo from August 26th - October 1st 2014.